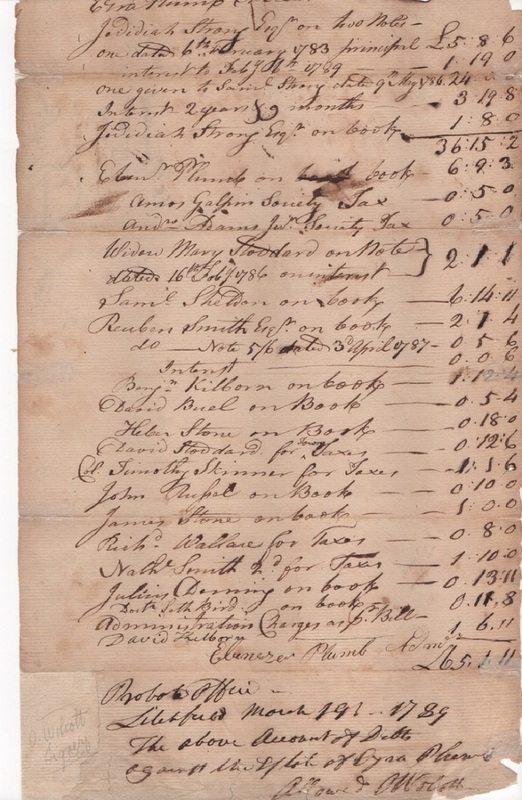 Oliver Wolcott - autograph endorsement signed at the conclusion of a list of claims against an estate, March 1789 signed at the bottom “Probate office-Litchfield March 19 1789 The above amount of debts against the estate of Ezra Plumb. P Howe & O Wolcott”. The list of claims is attested to by Ezra’s son Ebenezer Plumb. Ezra Plumb was one of the early settlers of Litchfield and presumably a much liked resident based on the long list of people who loaned him money or extended credit to him. There are long fold separations in two areas that should be repaired or reinforced. The signature is rubbed a bit in the last few letters of his name.